Kay-Bee Electric electrical contractors was founded after World War II in 1948 by John Kohnen and Jack Behlmann as a local electrical contractor. Working mostly in the northern suburbs of St. Louis, MO, Kay-Bee established itself as a mainstay in the local community and contributed to the rapid growth of the area. Kay-Bee Electric has been headquartered in Florissant for over 60 years. Over those years, Kay-Bee's reputation for qualityand reliability made it sought out by new and expanding businesses and institutions. Today Kay-Bee's electricians, engineers, designers and home office team work throughout the greater St. Louis metropolitan area, as well as other counties in eastern Missouri. We at Kay-Bee Electric are proud of our reputation and we have built a long list of satisfied customers. Our commitment to quality and reliability are hallmarks of our business. Kay-Bee's growth, stability and longevity are the result of our organization's commitment to customer satisfaction. Our customers can be assured Kay-Bee will always strive to be on time, on budget and right the first time. From wiring power electrical machinery, to installing electrical service for industrial electrical equipment, to wiring electrical service for hot tubs, Kay-Bee Electric has done it all. Kay-Bee Electric is committed to the success and growth of the area. We have sponsored many local organizations in the belief that a strong community contributes to the overall success and well being of our neighborhoods and our children. In 1987, John Kohnen was inducted into the National Academy of Electrical Contracting, a select group of fewer than 300 outstanding leaders in the industry. Kay-Bee Electric is a member of the National Electrical Contractors Association (NECA, www.necanet.org). NECA has been the voice of the $100 billion electrical contracting industry for over a century. The association consists of a national office and 120 local chapters dedicated to advancing the electrical contracting industry through advocacy, education, research, and standards development. 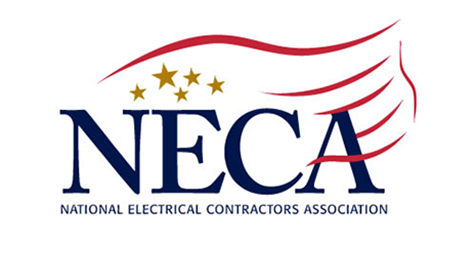 Kay-Bee Electric is a proud member of the National Electrical Contractors Association (NECA). Kay-Bee’s electricians and technicians are proud members of the International Brotherhood of Electrical Workers (IBEW) Local One.